Flux magnetic relaxation (flux creep) causes logarithmic decay on the critical currents in superconductors, especially at high temperatures, in detriment of applications for high temperature superconductors. In this work, we present a novel methodology to measure the flux creep rate in YBCO from electrical transport measurements instead of using traditional magnetic relaxation measurements. This new methodology provides a faster way to analyze creep and enables to expand the analysis to any orientation of the magnetic field. 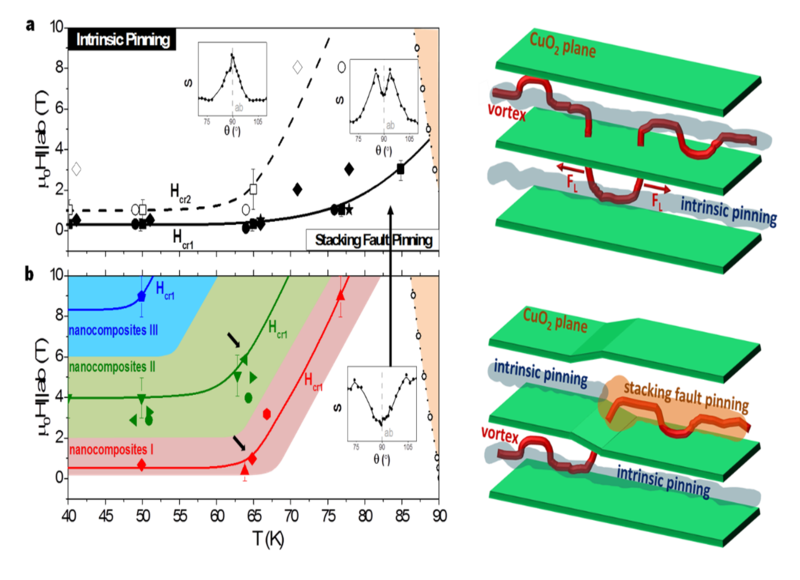 In particular, we have applied this analysis to study the creep rate in chemical solution deposited nanocomposites (YBCO with included nanoparticles), revealing that emerging stacking faults provide flux pinning and additionally reduce the flux magnetic relaxation.